Caffeine has long been proven to act as both a physical and mental performance enhancer but what people don’t realise is how amazing it is for your health as well. Consuming caffeine daily has been shown to have acute benefits for raising your metabolism, may improve insulin sensitivity and has also been linked to minimising visceral fat gain (organ fat) in those consuming calories in excess of their requirements. Siberian Ginseng is known as an adaptogen and has been shown to regulate cortisol, reduce systemic stress and provides long-lasting energy, mental alertness and an improved sense of well being. Tumeric is a SUPER SPICE! Supplementing with turmeric has been linked to improved blood glucose regulation and gut health but most noticeably, the active curcuminoids in turmeric have been clinically shown to reduce inflammation and improve pain thresholds in those suffering from inflammatory diseases. MCT’s are easily converted to ketones within the body, helping support and regulate appetite as well as improve mental clarity, be used for energy in the absence of carbohydrates and they also contain fewer calories per gram than normal fats with a low affinity to being stored as subcutaneous fat. Green Coffee Extract helps support blood sugar regulation, provides some additional natural caffeine and has been linked to reducing hunger. Utilising BioPerine, which is a patented black pepper extract, BioPerine enhances the absorption and assimilation capacity of other nutrients and may also support a mild increase in metabolic performance as well. 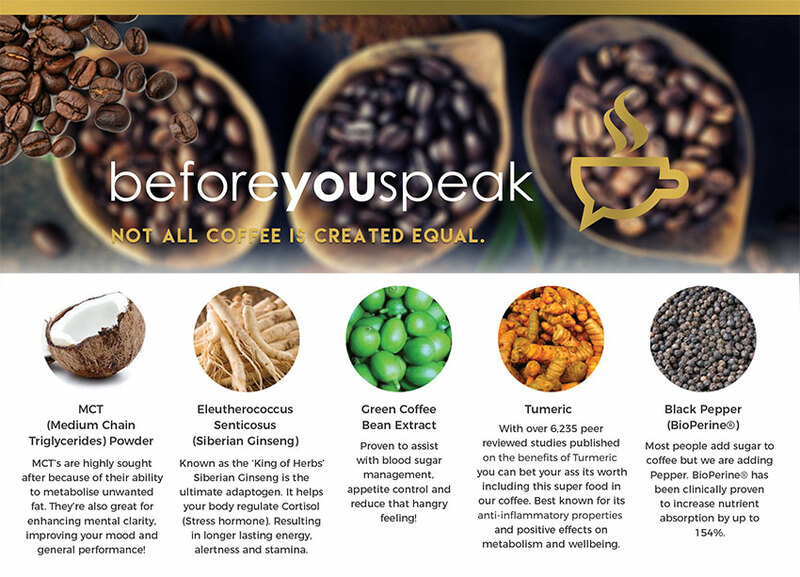 As you can see, Before You Speak Performance Coffee is packed with natural antioxidants and has not only been designed to give you that mental caffeine kick we have all come to love but it also supports long-term health through improved immunity, reduced systemic inflammation and reduced stress.